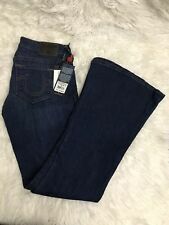 NWT True RE NWT True Religion Jean Karlie Bell Bottom Style WC658VK7R Color Cumd worn VN tag Size 27 Made in USA Retail $189 Karlie flare denim jean is a worn vintage wide leg bell bottom. This denim feature the classic and clean blue wash in a shorter inseam for favorite petite (32” inseam) 24 1/2” leg opening 84% cotton, 14% polyester, 2% spandex Authentic warranty or double money back. All sales are final. Thank you! These jeans are made in the USA and are in excellent condition. Inseam:32 in. GLAM UP YOUR DENIM WITH A GLIDED VERSION OF YOUR FAVORITE JEANS. MADE IN USA. STYLE : WV8A309ER2. COLOR : ABCD QUIET WATRS. FIVE POCKET STYLIN WITH SIGNATURE BACK POCKET. As shown in pics, the bottom cuffs show slight fraying. Zipper fly works perfectly with button intact. MADE IN THE USA! Waist: 13.5" across. Zip fly with button closure - 5 pocket construction - Logo embroidered detail on back pockets - Skinny leg - Low-rise - Approx. 7.5" rise, 32" inseam (size 26) - Made in USA. Sizing: 24=00, 25=0, 26=2, 27=4, 28=6, 29=8, 30=10, 31=10-12, 32=12. Length - 39" from waist to end of leg. MADE IN USA. In a dark blue wash, this jean is easily dressed down with a graphic tee or up with a beautiful silk blouse! Model: Billy. Stretching, heavy denim. Front zip fly and button closure. Composition: 98% Cotton / 2% Spandex. Style: Bootcut. Waist: 14 in. Contrast stitched horseshoe on back pockets. Color: Body Rinse. Flap back pockets. Machine Wash. 68% Cotton, 28% Polyester, 4% Elastane. True Religion Billy Distressed Straight Stretch Denim Jeans. Medium Blue. Woman’s Size 27. Inseam 32. Pre-owned In Excellent Condition. Please See Detailed Pictures. Great Price & Fast Shipping. Skinny fit. Skinny leg. Dark wash, fade at thighs and seat. 5-pocket style, contrast stitching throughout. Zipper fly with a button closure. Color - Spring Break. Mid Rise - Zip Fly - 5 Pocket Design. Back Patch is Denim with White Embroidery. Across Hem 8 1/2" Rise 8 1/4". TRUE RELIGION Joey Blue Denim Bell Bottom Flare Boot Cut Jeans Pants 27 / 31"
Bell Bottom Flare Jeans. Dark Blue Denim. Front Rise→ 7.25". Back Rise→ 13.25". Waist→ 30". Inseam→ 32". Hi for sale are the jeans pictured above. The jeans are in great condition and will be shipped within 24 hours of payment received on business days. If you are interested in multiple listings let me know and I will combine shipping to make it as cheap as possible. If you have any questions please feel free to ask me. Thanks for looking and have a great day. 32" INSEAM. 13.5" WAIST LAYING FLAT. (Rise is either low or ultra low. Waist 27", inseam 32", outseam 40 3/4". Left leg has 2holes 1 above the knee, the 2nd higher up), and a vertical tear just below the pocket. Great Britain & Northern Ireland. Small scuffs at the bottoms, barely even noticeable. Yellow Stitch. with distress holes in front. Size 27 x 34" L.
Style: #503. These are dark blue denim jeans. Jeans are in good condition. ITEM CONDITIONS ARE THOROUGHLY DESCRIBED AND MULTIPLE PICTURES PROVIDED TO SHOW THE CONDITION. Large brass buttons placed at points of stress for extra support. Thighs are Tattered and holey. Pockets are worn. Whiskering throughout. Leg bottoms are frayed and worn. 100% cotton. Thigh (approx. These jeans are in GREAT Condition! No wear in crotch. Zoom in on images. (within the U.S.). ). Worn but in nice pre owned condition. Julie Skinny. Dark Wash. Leg Opening - 5 1/2" (11"). Marked as Size 27. Waist - 14 1/2" (29"). Overall Length - 40". Little sign of use. I am always more than happy to make it right with you. Pre-owned as is I do have pets and a fireplace. See photos they are part of the description these are distressed wear on bottoms - measurements are in photos I do not accept returns. Condition is Pre-owned. See photos for more information. The size is 27 and were barely worn and is in excellent condition. A REALLY NICE PAIR OF JEANS IN REALLY GOOD CONDITION AND A GREAT PRICE!! Condition is Pre-owned. Good condition soft denim jeans. Flare at the cuffs.